Removing a Mercedes instrument cluster from any of the chassis listed is easy with these special "pull" tools. Many owners do not realize that the instrument cluster is just pushed into the dash panel and not held in with any bolts or screws. To remove the cluster all you need to do is pull it out. But trying to get a good hold on it is another matter and without the right tools you can break the clear plastic instrument cover or damage the padded dash. You first insert these tools on either side of the cluster. Then you rotate the tools 90 degrees, "hook" the sides and pull it out. Kent recently set out to "build a better mousetrap" by improving the original factory tools. He wanted a tool with a stiffer wire, better handle arrangment, a little shorter, a marked way to determine how deep the tool is inserted, and a means to "side load" the hook so it would not pop out when pulled hard! SORRY YOUTUBE PROMOTION IS OVER. First 25 sets of these tools have already sold. LED dash bulbs can be ordered separately below ( see related products). PLEASE NOTE: Kent's video instructions only cover using the tools to "PULL" the cluster loose from the dash. They DO NOT cover disconnecting the wires and cables from the back in order to get the cluster out of the car. There are too many variables to be able cover all the different models from 1972 to 1999. On some models you will need to disconnect the speedometer cable to get it far enough out to work on it. 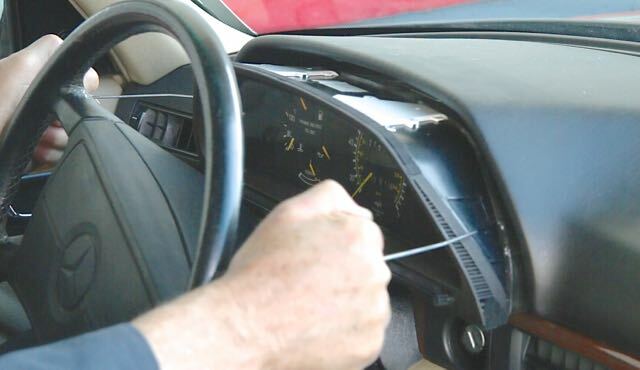 Please see my manual on Instrument Cluster Removal if you have not done this job and need more information to help you completely remove the cluster from the car (see related products below). R107 SL Owners: In most cases you will need to remove the steering wheel to get the instrument cluster out. The instructions also DO NOT cover the removal of an SL steering wheel or disconnecting the air bag on 1986 to 1989 SLmodels. See related products below for video on removing non-airbag steering wheels.